Often regarded as one of the best Broadway musicals of all-time, Stephen Sondheims 1979 Sweeney Todd: The Demon Barber of Fleet Street has long been deemed impossible to adapt for the big screen. Extensive, unique and unabashedly gore-filled, the story mixes music and horror as barber Todd goes on a vengeful killing spree through 19th century London. However, the recently revived Hollywood interest in movie musicals offered an opportunity, and Tim Burton and long-time collaborator Johnny Depp jumped aboard to attempt the supposedly unachievable. And while it is questionable whether their ambitions are fulfilled, its doubtful that there are two people better suited for the task. The story follows Todd (Depp) as he returns to London after a 15-year wrongful banishment at the hands of the diabolical Judge Turpin (Alan Rickman). Turpins unholy interest in Todds wife and daughter was what brought Todd (formerly Benjamin Barker) down, and our newly demonic anti-hero is out for some serious blood. At his side is his landlady, Mrs. Lovett (Helena Bonham Carter), who, blinded by her love for Todd, assists Todds psychopathic activities, baking the victims into pies for her shop. Burton has set himself up with a very daunting task: pleasing fans of his own work, as well as the Sondheim fanatics, while fully realising complex themes mixed into a precious balance of horror and musical elements. And, for the most part, he succeeds. The film is horribly entertaining, with plentiful and well-orchestrated gore and music throughout. Every frame looks like a painting, with the sets, costumes and cinematography complementing one another perfectly. 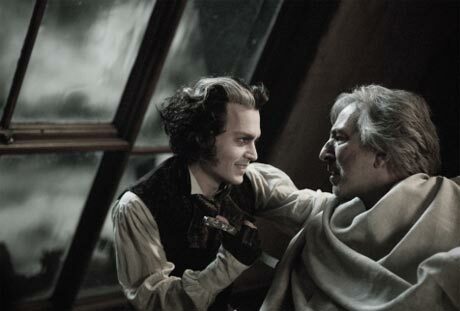 And Depp and Bonham-Carter, undeniably well cast, lend their untrained voices just fine. Their new variations on rather legendary characters prove well suited for the medium, and they manage to carry the film with a specific demonic grace, which is no small feat in itself.